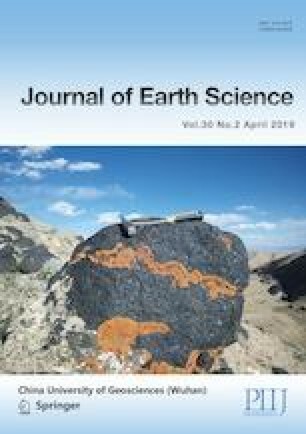 In this study, we report zircon U-Pb age and geochemical data on the Middle Permian siliceous clastics and basalt samples of Lugu Formation collected in the Yaqu region from central Qiangtang. Combined with the published data, we establish the spatial and temporal evolution of the rift in central Qiangtang from the Early to Late Permian. Zircon U-Pb dating by LA-ICP-MS yields a concordant age with a weighted mean 206Pb/238U age of 266.6±2.8 Ma (n=6, MSWD=0.55) for the basalt. The results of detrital zircons from the siliceous clastics exhibit a prominent population of 257–270 Ma with a maximum depositional age of 265.4±2.6 Ma (n=19, MSWD=2.7) and three minor populations with peak ages of 450, 700–800, 1 800 Ma, as well as one older age of 2 039 Ma, generally coinciding with the geological events that occurred at different epochs in Qiangtang. The basalts display enrichments in high-field-strength elements (HFSE) such as Th, Ta and Hf, but show relative depletion in large-ion-lithophile elements (LILE) such as Ba, K and Sr, as well as slight depletion in Nb and exhibiting no Eu anomalies. All the samples are distributed in the within-plate setting on the Zr vs. Zr/Y and Th/Hf vs. Ta/Hf discrimination diagrams. The integration of these new data together with the regional geological background indicates that the Lugu Formation was formed in a continental rift-related setting of the central Qiangtang terrane during the Middle Permian. We propose a temporal and spatial framework that the continental rift opened as a result of the break-up of Gondwana during the Early Permian, ran to its peak in the Middle Permian and closed in the Late Permian (290–257 Ma), which could be a key constraint on the Permian evolution of Qiangtang. Supplementary material is available for this article at https://doi.org/10.1007/s12583-019-1209-x and is accessible for authorized users. We appreciate Professor Zhaochu Hu for helping with LA-ICP-MS U-Pb analyses. We would also like to express our appreciation to all members of the project team from the Chengdu Center of CGS, for their support and assistance during the fieldwork stage of the study. This study was jointly funded by the National Natural Science Foundation of China (Nos. 41502112, 41702119) and two programs under China Geological Survey (Nos. 1212011221114, DD20160159). The final publication is available at Springer via https://doi.org/10.1007/s12583-019-1209-x.